LondonJazz: CD REVIEW: Monty Alexander Trio – Montreux Alexander Live! CD REVIEW: Monty Alexander Trio – Montreux Alexander Live! Monty Alexander Trio – Montreux Alexander Live! The Jamaica-born pianist Monty Alexander first came to fame in the 1960's after settling in New York, his many albums helping to make him the international attraction that he still is today. In more recent times, he has stressed his Jamaican-roots employing musicians from the island. 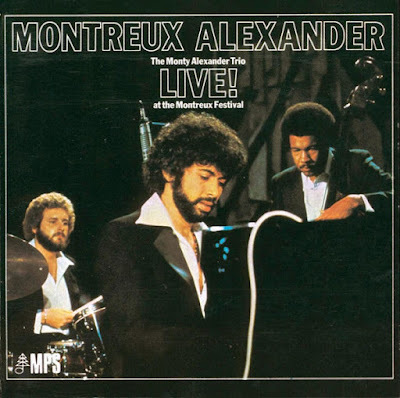 Here, though, in this live [and newly re-mastered] recording, taken from his performance at the 1976 Montreux Festival, Alexander stays with the classic trio format of piano, bass and drums, the compelling interplay with his companions, bassist John Clayton and drummer Jeff Hamilton, much like that achieved by Oscar Peterson and his companions. On this showing, Alexander had even greater urgency in his playing than Peterson, his extemporisations executed with less ornamentation than OP might have used, the trio’s drive and momentum often quite breath-taking. All of this is apparent on the ten-minute version of Ahmad Jamal’s ‘Nite Mist Blues that opens the album. On this evidence, Alexander clearly enjoyed seeing where his ideas would take him, bluesy right hand trills contrasted with percussive thumps and gospelly flourishes, before straight four-four swing, Clayton and Hamilton kicking hard. While his harmonic ideas might be said to have paralleled those of Oscar’s, it’s Earl Hines’ methodology that most often comes to mind, as Alexander shifts tempos, changes emphasis and takes off in all sorts of quixotic directions. He even makes me appreciate Satin Doll, one of the most hackneyed and over-familiar of Ellington pieces, taking it apart, re-shuffling the harmonies before moving into Garner-like trundles and ‘swinging like a deranged pendulum’ in annotator Mike Hennessey’s well-chosen words. His reading of Feelings is gentler before he produces a rousing version of Nat Adderley’s iconic Work Song, every spontaneous move and variation greeted with ecstatic applause, before taking with the closer ‘Battle Hymn of the Republic’ taken on a uniquely helter-skelter journey, Clayton and Hamilton up for every inventive twist and turn. Trio magic.